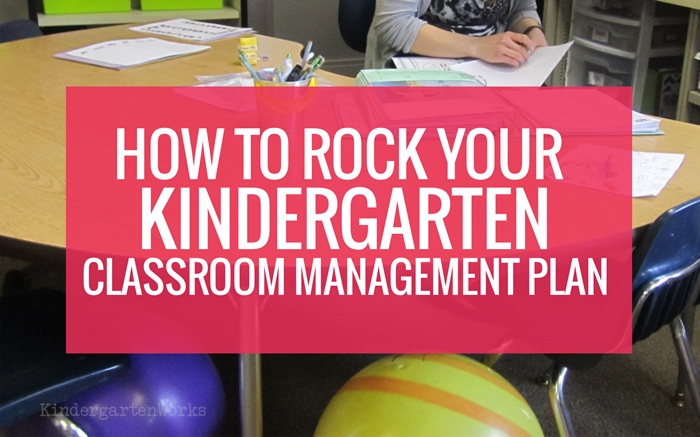 Think through a solid plan for classroom management for kindergarten. Here’s what makes a good classroom management plan, how to plan rewards and consequences and I’ll share my own classroom management plan with you. 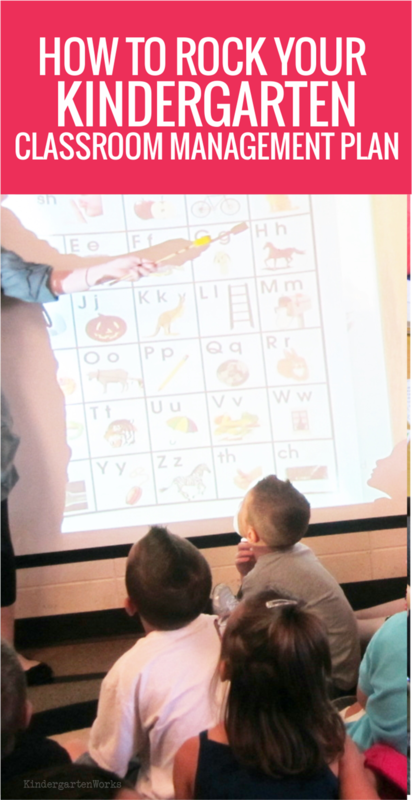 Let’s start out by identifying what makes a good classroom management kindergarten plan. That way you can rock your own! 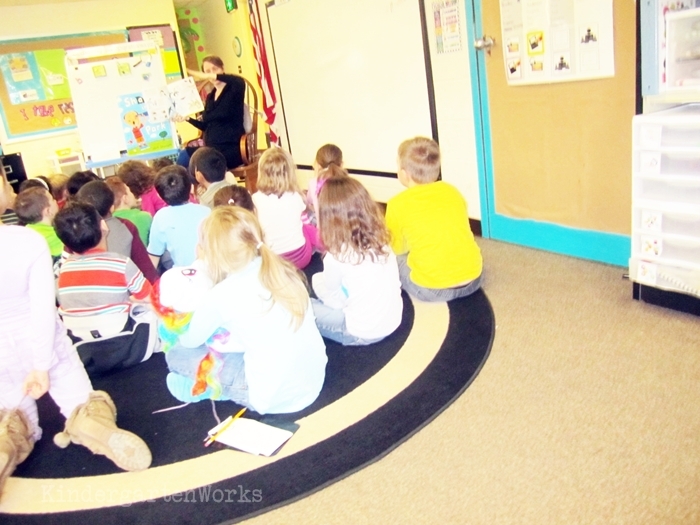 Keep your kindergarten classroom management plan simple. It’s the best way to start because you can always tweak and improve it later on. Lets be honest – you can even totally overhaul it part way through the year if you need to. Plan your basic classroom rules that cover pretty much everything and your rewards and consequences. Think about the class as a whole and at the individual level. Pick and make a plan that you can follow through with and doesn’t promise the moon. If your plan has too many bells and whistles or requires you to remember every Thursday to buy popsicles on your way home from work for Friday rewards day… you may quickly tire yourself out. Don’t do that. It kind of goes back to point #1 – making a plan that is simple – because it will be easier to follow through with and you can always add to it later on. You also don’t want to make a consequence you don’t plan to give, or isn’t really convenient to dole out in most classroom situations. For example, I could pretty much give a time out anywhere during almost anything – so that was something I was comfortable picking as a consequence. The rewards and consequences shouldn’t really add time to your plate as a teacher. Whenever possible you should plan logically for things that already fit into your day. When I picked out reward coupons for my students I picked ones that didn’t require anything of me. When I picked consequences, I picked ones that would fit into our daily routine and activities without additional disruption to the class. I’m not saying I didn’t interact with students as they received their rewards or consequences – but I am saying they didn’t detract from keeping the focus on learning – which is why we are all at school together. Your classroom management approach should cover how you want to handle the class behavior as a whole. Being good at classroom management (handling the class as a whole) comes from overplanning the little parts of your day and teaching a lot up front. If you need work on teaching procedures, capturing attention, keeping attention or smooth transitions – you should plan a session with your favorite teacher in the same grade level who is stronger in the area you need work and hash out some solutions to the toughest parts of your day. Your classroom management kindergarten plan should cover how you want to handle student behavior as part of the whole class and at an individual level. As far as both my approach and plan to kindergarten classroom management? I like to focus on the positive. I also believe the classroom should reflect that there are consequences to the choices we make in life. We want parents to teach them that, so why wouldn’t I as the classroom teacher? That means I also have to think through consequences and discipline. Here I’m talking about dealing with kiddos one on one. I’m not talking about getting the entire class under control. 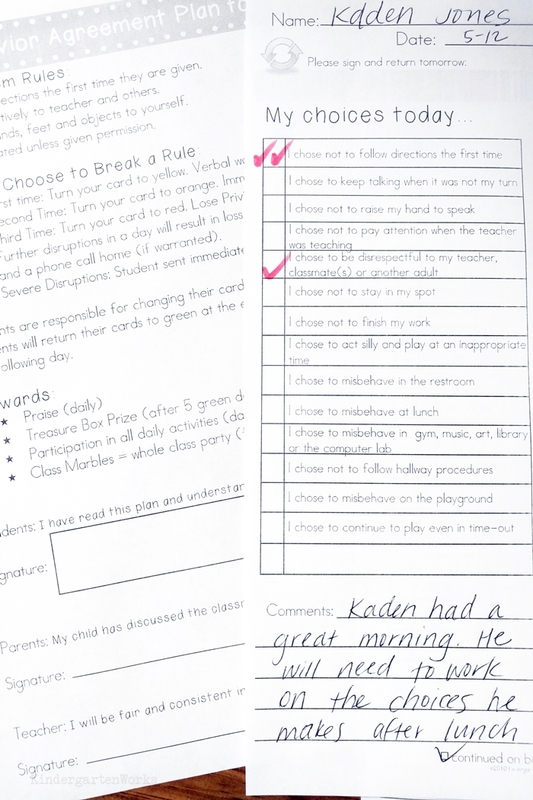 And I’m not a behavior specialist and you might not agree with my approach – but I like to share how I think, organize and teach – so here’s what I think makes sense and gives a sense of balance to classroom management and discipline. In my kindergarten classroom management approach, my focus is to keep the learning happening. It’s why we are together in the classroom after all. But I must consider what to do when learning is impeded by behaviors – that’s where the plan comes into place. My first reaction: I try to use natural consequences first and always reinforce that the 2 things in life we can control are our actions and our attitudes. 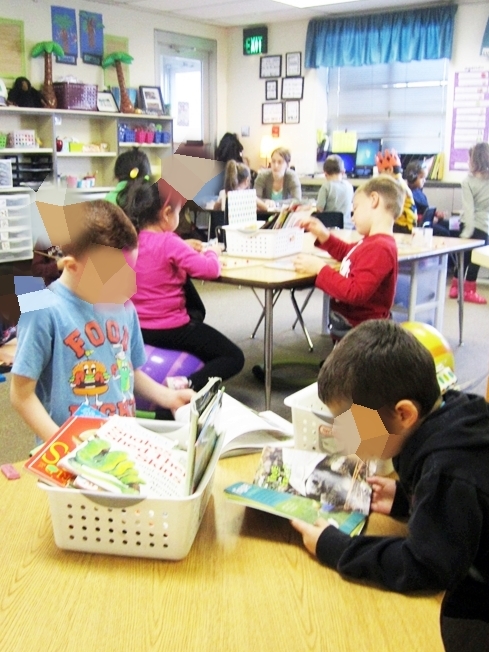 So with choosing logical consequences whenever possible – this sometimes means removal from activity, not getting to use materials for specified time, losing a choice or option (like with our alternative seating) or having a modification to the activity/time. Most situations in the kindergarten classroom are covered by those. For real. Those consequences go in tandem with a calm, verbal statement or explanation like, “You were expected to… and you chose to…” From there we apply whatever lines up in my classroom management plan. For the most kinders – that’s sufficient. It provides boundaries, expectations and keeps them accountable. But what about for those BIG disruptions or repeat offenders? Then I begin to question (or question later on if I can’t in the moment): Can I determine the why behind the behavior? If so that’ll help determine how to help fix it best. If they need your time and focus try The 2×10 Strategy. If they need breaks – give them what our occupational therapist called “heavy work” and have them deliver something physically heavy to the library, office or another classroom and later go pick them up again. Something to give them a seemingly purposeful break that involves specific physical activity different than what they are experiencing in the classroom. Do they need an individualized behavior plan if the whole class plan isn’t cutting it? This gold mine of a post on creating an individualized behavior plan that has step by step directions. When it comes to making a classroom management plan – be sure to know how your admin will support you. You don’t want to plan something that you won’t be able to see through on. I share this because I had a kindergarten student flip a table – yes, I said FLIP a big rectangle table – my first year of teaching. That child was given a Mountain Dew to coax him out from under a chair in the principal’s office upon being removed from our classroom in an effort to duplicate the effects of his ADD medication he was without that day. Ummmm, yeah. In that instance, I didn’t quite feel the level of support I thought a removal from the classroom should have warranted. And it didn’t really make me feel like I was able to follow through on part of my plan if students were semi-rewarded for being removed from the classroom. Have a real conversation with your administration if you’re new (or they are) about what you can expect, about what any formal procedures might be (for big occurrences) and also ask other teachers to share their positive experiences of feeling supported or lack thereof – but don’t gossip. Nobody needs that. 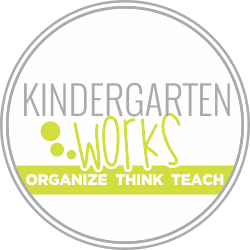 Consider where you can make improvements to your current kindergarten classroom management. 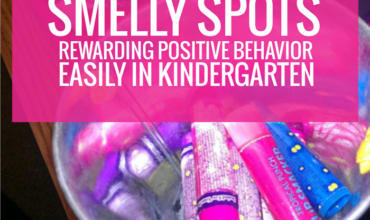 For me, I wanted to build in communication with parents about their child’s behavior. We used daily folders for that. I wanted not just to communicate about the color the child received for the day – but for the choices they made. So we used a note home that explained the choices the student made when they went home on red. 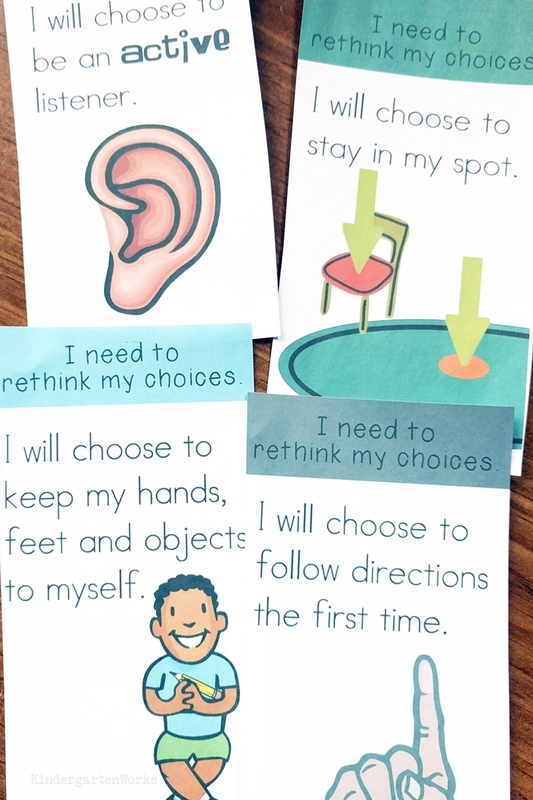 Plus, to help the students remember their choices better, I introduced think cards. We added think cards to our classroom management plan instead of having physical colors (green, yellow, orange, red) posted on the wall. Each think card was for a specific behavior and rule from my classroom management plan. Students used those to reflect on how to improve rather than just focus on the color itself – but each card earned meant a change in color. 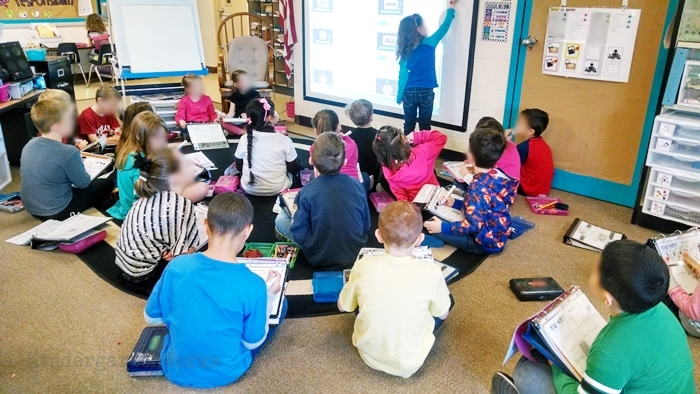 Here’s another teacher’s story about how she ditched her clip chart to tweak her system. To hold students accountable for their actions, I believe they should be taught what I expect. I tried very hard to always explain my expectations before we did anything for the first, second or third time. 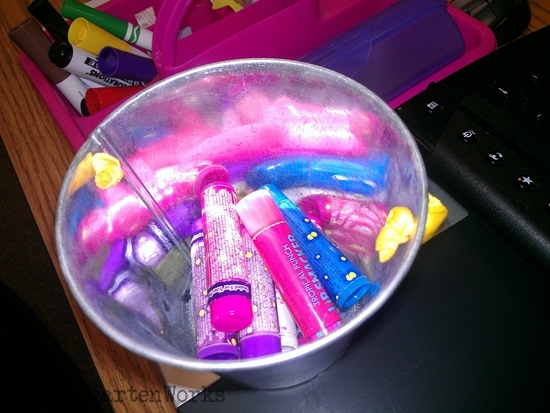 It gave me the freedom to be consistent in managing my classroom. If I don’t tell the students the details of what I’m expecting from them while we [insert any activity] and someone starts to [undesired behavior] then I hem and haw over putting a consequence in place or even hesitate to give a warning. I play mind games because they should “just know” that it’s not appropriate but I may also feel guilty about calling out their behavior. If I do tell them the details of what I’m expecting from them and someone is not getting with the program then I feel confident in seeing through with a warning or consequence – whatever is needed. Doing this impacts the way I think, act and speak which ends up changing the dynamic in the moment that I need to redirect or correct behavior. What things should you hold them accountable for? 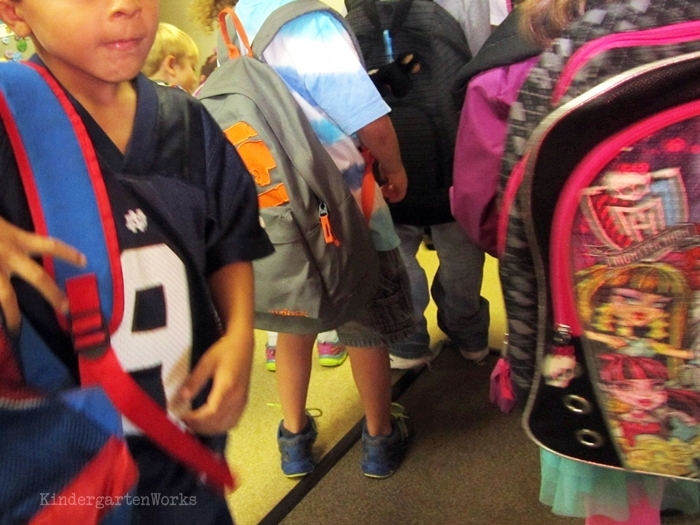 Well, here is a list of classroom procedures to get you started thinking. Here are the components to my kindergarten classroom management plan. It is what worked for me. I tried to keep it simple, didn’t promise anything I couldn’t deliver on and it fit into the daily life we lived in the classroom. We had four main classroom rules. Listen actively to the teacher and others. Stay seated unless given permission. That last rule evolved into stay in your spot as we transitioned to alternative seating styles. And the first rule – well, that really was a catch all rule. But I meant it. 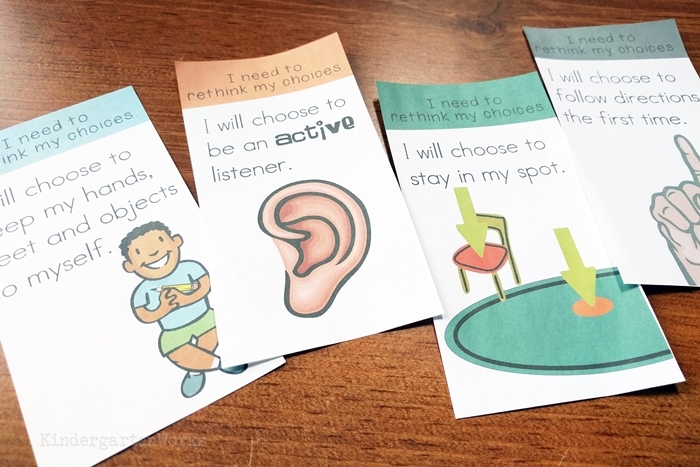 When I added the think cards to my behavior plan, one card went along with each color change. There were no physical color cards that they actually changed. The color was reported when it was time to go home in their daily folders. 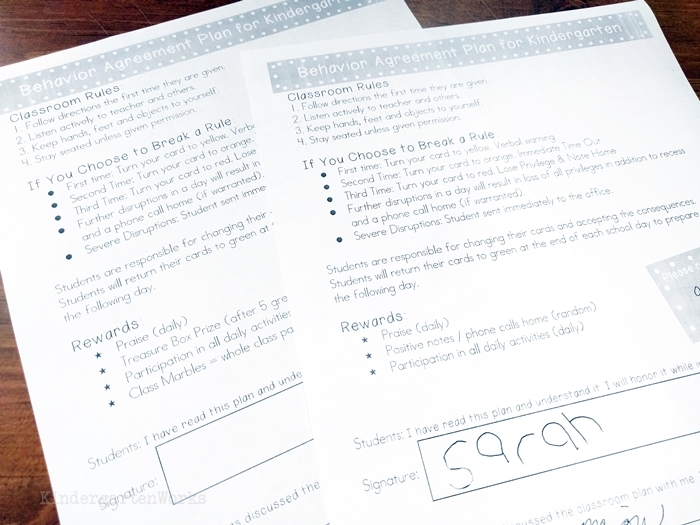 I have parents and students sign a behavior agreement plan that lists the rules, consequences and rewards. And I save those for documentation. If you like this behavior plan or want a template to start from you can get my Behavior Plan, Think Cards and Parent Notes today. Remember what makes a good classroom management plan, then plan out your rewards, consequences and get your classroom management plan into place! I purchased your behavior parent notes today. I thought that the Today I went to Red Because template would be in there because thats what was shown. Anyway I can get a copy of that one? Thanks for your purchase. 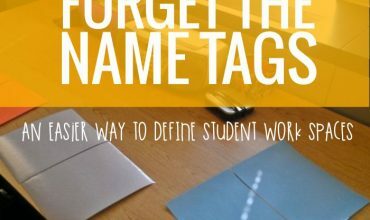 I’m sorry if some older pictures still floating around pinterest mislead you to the title that now is on the notes home for when a student goes to red. I no longer have that version so I’m unable to share it with you. You can request a refund (through the website you purchased through) if it’s not something you’re still interested in.